I have been trying to get some cards made but the success rate has been rather low! I have a couple here which sort of do something but there are so many incarnations in the bin! This one is for the sketch at Happy Little Stampers and is a fairly literal translation of it as you can see. I stamped the sentiment is Versamark and embossed in white (the clear version didn't fare so well). After this I applied drops of Aqua Tint Inks with a fairly large watercolour brush, which I spritzed with water to allow the colours to bleed into each other and the surrounding card. The panel was then mounted on some toning card and die cut with the holes. I kind of mis-recalled a sketch for this one... I omitted a fundamental element of it and then, because of the image I had chosen, couldn't manage to add that element to the card, so I'll have to start again with that challenge. 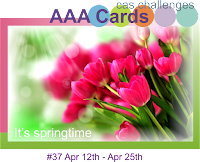 This is however for the challenge at Casology - News, the Springtime challenge from AAA cards and Addicted to Stamps Clean and Simple. The stamp is from Stampin' Up. There doesn't appear to be a problem with your mojo from where I'm sitting Chrissie. 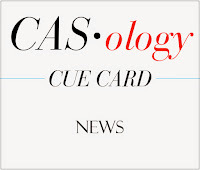 Two awesome CAS card! Thank you for sharing at ATSM. Where's the missing mojo? 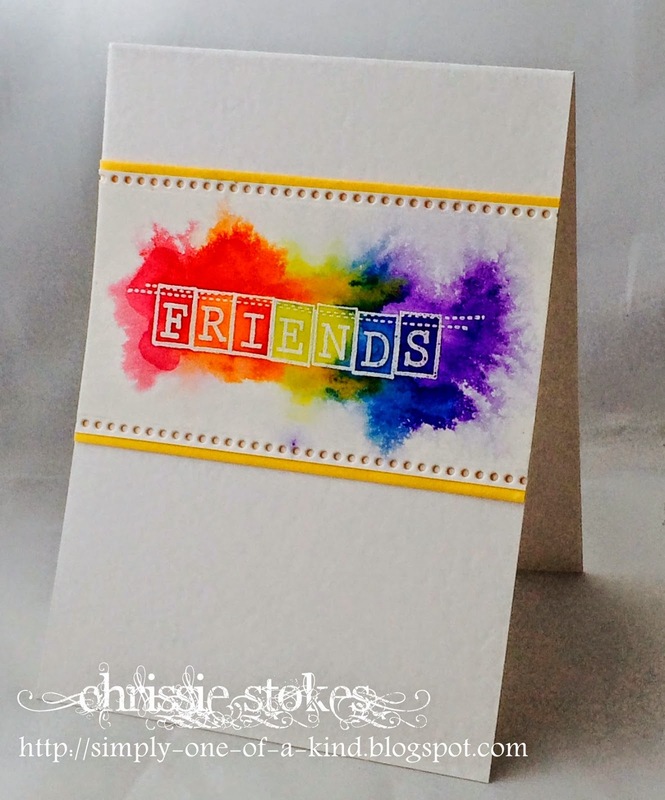 Stunning cards as always Chrissie! Love the vibrant colours of the first one and the newspaper round the tulips on the second card is so appealing. Thanks for playing at AAA Cards. Great to see you've played along at AAA Cards too Chrissie. These are fabulous! Your mojo wasn't missing for long. I think both your cards are wonderful! 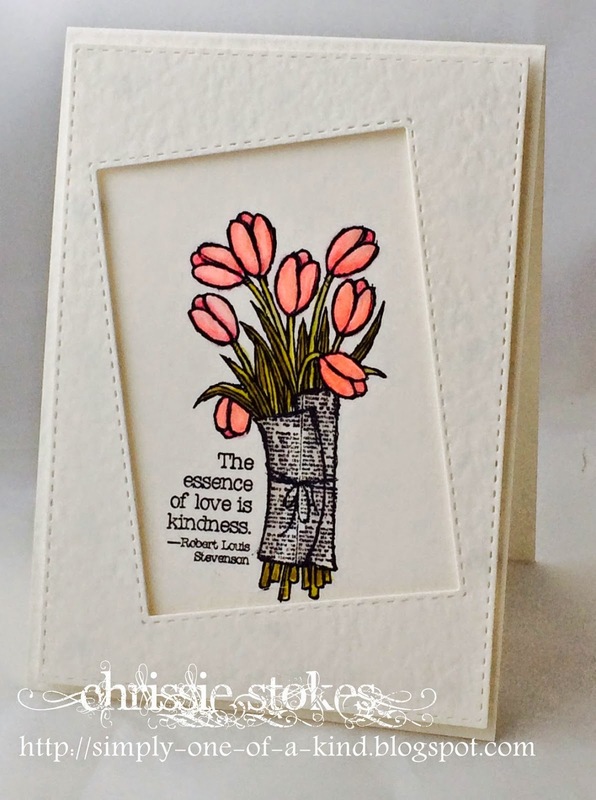 Your HLS is a rainbow of delight, while your tulips are just so Spring-time splendid! Gorgeous, both! Thank you for sharing in the ATSM gallery! I find when I try to force something, I'm never satisfied. I love the tulip card, well colored and CAS. Lovely for NEWS and Springtime, so sweet. I think these are so GREAT!!! Thanks for joining us at AAA Cards, we are very glad that you are sharing your creativity with us!! !